Last year, a scene from the game Grand Theft Auto: San Andreas inspired an odd fast food mystery when it resurfaced online. During a routine drive-through stop at Cluckin’ Bell, one of the GTA series’ recurring fast food joints, a character named Big Smoke lays down a monstrous order of seven different value meals, plus one more large soda for good measure. It got people wondering: What exactly did Big Smoke order? Through a combination of speculation, necessary logical leaps, and the ancient Cluckin’ Bell promotional website, YouTuber ComradeWarbear put together a real-world analog using items from various restaurants, speculating that the whole thing clocks in at 7,540 calories. 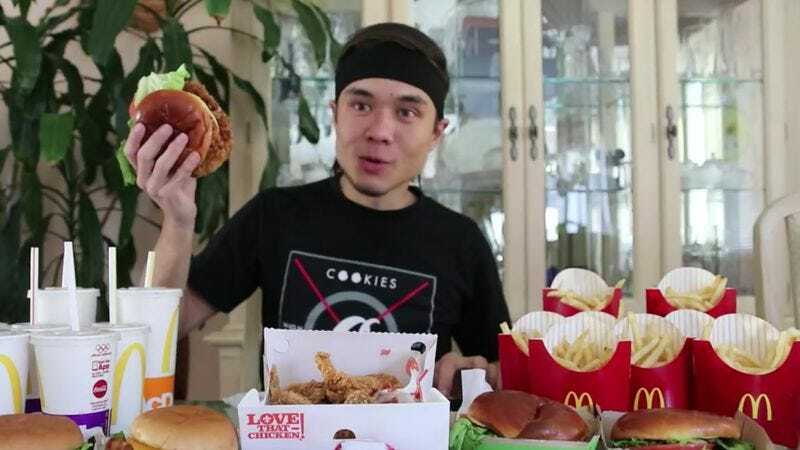 Now, competitive eater Matt “Megatoad” Stonie has made a video recreating Big Smoke’s legendary meal, but that horrific calorie count wasn’t enough for him. No, in a valiant attempt to up the stakes of this food challenge, he created a variation on ComradeWarbear’s findings that bumped the intake to 9,050 calories. It took Stonie less than 35 minutes to devour every last sandwich, chicken wing, french fry, and tub of soda, but for everyone’s sanity, he’s trimmed the footage down to 10 minutes of greasy anguish. Big Smoke would be proud.